In the past (and in many dental offices still today), getting a crown or other dental restoration was quite a process. Your first visit would include traditional impressions (holding messy, nasty goop in your mouth) which would then be sent to an off-site dental lab for your restoration to be created. You would have a numbing injection to prepare the tooth, and be set with an ill-fitting temporary you would have to wear uncomfortably for a few weeks. You would then return for a second visit, get another injection, have the temporary removed, and finally be fitted with the final restoration. Are we having fun yet? That is not how we do things at Veranda Dentistry. At Veranda Dentistry, our advanced CEREC® technology allows us to digitally design, fabricate and place restorations like inlays/onlays, crowns, bridges and veneers in a single office visit! Final restoration the same day! At Veranda Dentistry, our cutting edge digital technology allows us to create the perfect precision restoration that will blend in seamlessly with your natural teeth. We use beautiful tooth colored porcelain to precisely match your exact shade and translucency, and our restorative materials are strong and durable for a smile that withstands the test of time. Aside from a simple filling, inlays and onlays are the most conservative option for restoring a tooth. Whether you have a larger area of decay, or your tooth has been chipped or broken, an inlay or onlay is a great way to restore the aesthetics, health, and function of your smile. Inlays and onlays are used to supplement the natural tooth and fill in areas that have been decayed or damaged. Inlays repair damage contained within the cusp (outer ridge) of the tooth, while onlays are slightly larger and repair damage that extends beyond the cusp. Inlays and onlays require minimal removal of healthy tooth structure, so they are a great option for patients who need a restoration but don’t quite require a full crown. With our advanced CEREC® same day technology, we can usually complete the whole process in a single visit! Read more about the benefits of CEREC® same day technology above. If you have a tooth that’s been badly decayed or damaged, and is beyond the point of repair with an inlay or onlay, you may need a crown. Crowns are tooth shaped caps that are fitted over any remaining healthy tooth structure to restore the tooth to its fully functioning, beautiful condition. Crowns do require some removal of healthy tooth structure in order to make room for the new restoration and ensure it fits and functions properly. If you are missing a tooth entirely, and are a candidate for dental implants, we can give you the most recommended single tooth replacement with an implant supported crown (full fabricated tooth anchored to an implant). If you’re suffering from a broken or missing tooth, you probably already know it is in your best interest to have it repaired and restored. A crown can help you avoid further damage to the tooth, enjoy your favorite foods again, and speak and smile with confidence!With our advanced CEREC® same day technology, we can usually complete the whole process in a single visit! Read more about the benefits of CEREC® same day technology above. If you’re missing a tooth or several teeth, we may recommend a porcelain bridge to fill the gap and bring balance back to your smile. 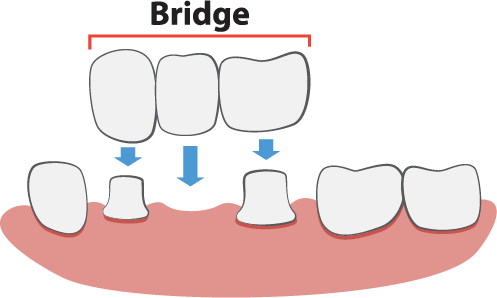 A bridge consists of one or more fabricated teeth, usually anchored to surrounding teeth with crowns on either side. When one or more teeth go missing, it can really throw your whole mouth out of whack. Your alignment may shift, your bite forces may change, and your TMJ or jaw joint may eventually suffer the consequences of this imbalance. Bridges are a wonderful permanent solution for missing teeth. If you are a candidate for dental implants, we may recommend adding the extra layer of security and jawbone health with an implant supported bridge. If you are missing most or all of your natural teeth, or living with ill-fitting dentures that don’t stay in place, we would love to help you get your smile back. At Veranda Dentistry, our modern dentures are precision crafted using our advanced technology to perfectly mimic your natural smile in every way – no one will know you weren’t born with it! We offer traditional dentures that sit on top of the gums, as well as implant supported dentures, which is the most recommended solution. Dental implants help preserve jawbone health and density, and actually stimulate new bone and tissue growth around the implant. They also serve as anchors for permanent, non-removable dentures that are locked in place. No more messy denture adhesives, or dentures that rock and slip. If you are a candidate for dental implants and are looking to regain your ability to enjoy your favorite foods, clean and maintain your teeth naturally, and gain freedom from removable dentures, we would love to speak with you about implant dentures at Veranda Dentistry. While root canals may have earned a bad rap over the years, we assure you they are nothing to fear. It is actually the pain of an infected tooth left untreated that is worse than the root canal itself. If you have an infected tooth that is causing you pain, you may require a root canal. Dr. Johnson will go in and remove the infection, sterilize the chamber, and fill it to prevent further infection. We will then seal the tooth with a crown to bring it back to its healthy, functioning condition. If you are experiencing tooth sensitivity or toothache, you should see your Pleasant Hill dentist right away. Don’t wait for the problem to fix itself, because it will only get worse! If you have any questions about restorative dentistry, or would like to schedule a visit with your Des Moines dentists, Dr. Chad Johnson and Dr. Emily Flesner at Veranda Dentistry, give us a call today at (515) 650-5531 or request an appointment online!